This course will include in-class close readings of pertinent passages in writings on psychic change. Dr. Susan Kavaler-Adler, the course instructor and the founder and executive director of the Object Relations Institute, will offer background education from the writings of Sigmund Freud, Melanie Klein, Ronald Fairbairn, D. W. Winnicott, Michael Balint, Betty Joseph, James Masterson, Otto Kernberg, Heinz Kohut, Margaret Mahler, Althea Horner, Michael Eigen, and of her own. This background information will be taught when interacting with the reading of passages from Dr. Kavaler-Adler’s book The Anatomy of Regret: From Death Instinct to Reparation and Symbolization in Vivid Case Studies (Karnac, 2013). Reading The Anatomy of Regret will introduce the participants to the narrative stories of individuals who find their true selves and their authentic voices through the object relations psychoanalytic journey. 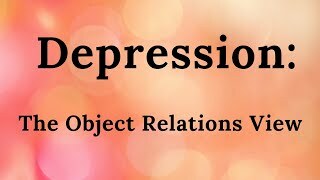 A particular focus will be on how mourning is a developmental and clinical process, where subjective experiences of aggression can be transformed into self-assertion and capacity to love and create, when this aggression is experienced in relation to conscious facing of regrets. Movement from the pre-symbolic to symbolic level of psychic change will be discussed through the narrative tales and therapeutic dialogues. First Class: Transformation of aggression. This class will concentrate on the role of aggression in the “developmental mourning” process (Kavaler-Adler, 1993, 1996, 2000, 2003, 2013a, 2013b), and also - on how the facilitation of this process leads to psychic change. Dr. Kavaler-Adler will offer clinical case examples in specific readings of passages. Second Class: Transformation of the schizoid personality and schizoid phenomena (which relates to all of us). The role of rage, grief, loss and longing, related to resolving addictive ties to internal world's bad object parents will be discussed through the reading of the passages, and also through role plays. Third Class: The nature of guilt. In this class, Dr. Kavaler-Adler will target the critical clinical and developmental difference between neurotic guilt, which requires interpretation, and existential grief, which represents one’s actual guilt that can be healed and transformed into constructive relational capacities, through mourning and interpersonal and intrapsychic reparation. Fourth Class: The nature of psychic pain. In this class, references will be made to the work of Betty Joseph, the neo Kleinian theorist, who introduced this phenomenon. Clinical passages will be read related to the birth of the authentic self through the conscious engagement with psychic pain, and with the specific form of psychic pain in the mourning of regret. Fifth Class: Intolerable vs. tolerable pain/regret/loss/aggression. This class discussions will focus on how intolerable pain—and the rage that underlies this pain—can be transformed into tolerable pain, which can be felt consciously, and thus mourned through the engagement of symbolic level self- and object representations. As rage, loss, grief and longing are broken down into their essential affective elements, a “developmental mourning" process ensues. Sixth Class: The development of compassion, love and forgiveness. How does the mourning of loss, and the related understanding of rage within such a mourning process, allow for the capacity to love and forgive? How does this develop through “developmental mourning” into a profound and critical human capacity for compassion? Critical passages from the clinical case showing development of compassion and a sense of interiority will be read. Seventh Class: Capacity for play and capacity for love. In this class, the main topic is the development of the capacity for love through mourning and its engagement with the haunting ghosts of past guilt related to mothering. How does the mourning of self-sabotaging losses helps to develop one's capacity for play and capacity to love? Discussion of the clinical example (from The Anatomy of Regret) of one patient with deep regrets related to her profound failures in mothering will follow. Eighth Class: Negative transference, "bad object" transference, and psychic change. 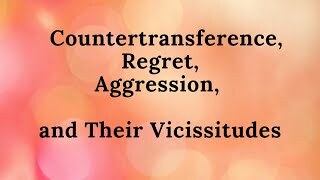 How can we successfully engage with negative transference in order to facilitate “developmental mourning” and psychic transformation? 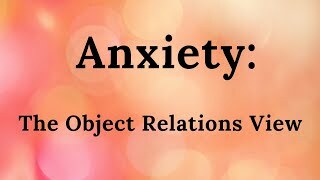 We will discuss the "relational" issues that can interact with the object relations issues within the internal world, as well as perpetuation of childhood experience in "psychic fantasy" states. Ninth and Tenth Classes: Resolving blocks to commitment in marriage through facilitating the mourning of regrets after an extramarital affair. The Ninth and Tenth classes will highlight some of the couples' therapy issues, as well as well as individual psychotherapy issues. 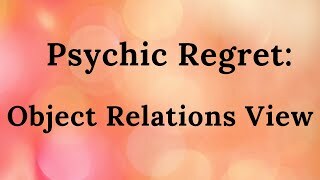 We will discuss how the facilitation of mourning the losses of self and other sabotaging regrets can become a developmental process to sustained intimate relations, and towards a long-term commitment. “The session is memorable for is dialectical poles of hate and love, spinning around a father object [internal world]that had been coming increasingly to life, as part object forms come into whole object forms as the soul and psyche integrate. By the midpoint of the session Sharon was recalling the hate for a father who epitomized all the forms of failing her, that left her alone and that left her feeling in orbit in the world, as if she had been a changeling dropped arbitrarily into a family system that seemed totally detached and strangely alien to her, where she also felt like and alien. Sharon spoke of a rage coming awake from her unconscious, where it had been split off and dissociated, a rage that made her feel as if she had been on fire, with hot wires of hate streaming through her entire body. Her images revived my memories of Edith Sitwell’s Poetry, as the British poet had spoken of being a bush of flames on fire, in relation to her own father (“father-mother” as intrapsychic fantasy “demon lover” (see Kavaler-Adler 1993b, 1996, 2000). She recalled her father’s letters to her at camp with nauseous disdain, suffering the thoughts of how out of touch her father was with any center of being, hers or his. She hated him for his letters. As she said this, Sharon erupted in an agony of grief, fighting to breathe as her tears flooded her and washed out the hot wires of hate that possessed her as all bad objects possess those who cannot love. A new level of memory entered the door of my consultation room, a level of memory that neither of us had witnessed before. She remembered an early daddy that she had kept immured in the closet of her mental closet up until that very moment. He was a daddy who she now believed, in this very moment, had truly loved her. “I never believed that my mother had truly loved me,” she said, but I always knew my father had loved me. I forgot it all, the daddy who loved me, the daddy I loved.” Her tears washed her eyes red, and I could only see them when she got up from the couch at the end of the session. “I was so mean. I turned my heart cold. No wonder my first marriage failed and I almost destroyed my second marriage.” As her analyst, I felt the poignancy of the moment, her heart crying out to me with her newfound capacity to love. We had discovered her daddy. I wanted to sing as her grief washed us up on the raft of her core self, embedded in a barbed wire ego that could now surrender to love and to life! When she left the session that next day we both knew that change could definitely happen.